Finally I can post some pictures of Christmas gifts! I made the jumper on the left for my 16-month-old goddaughter. The jumper on the right if for her brand new baby sister. 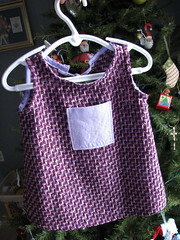 This was my first real foray into making my own baby clothes. I decided to use Simplicity patterns (4383 and 9911) in the hope that they were actually simple. I think it was a wise choice on my part. I found that baby clothes are a lot more forgiving than big-people clothes. You don’t have to worry about fitting them precisely. There are no darts in baby jumpers! I also found that girl clothes are so much more fun than boy clothes. There is a lot more variety involved in making a dress than in making the same old shirt-and-pants play outfit. I’m tempted to start making dresses and hoarding them away in the hopes that one day I will have a girl of my own, but when I suggested this to my husband he gave me a look that said he thought I was a crazy person. I may be crazy, but at least I will have a well-dressed imaginary daughter! OK, OK, I’m not going to start making dresses for imaginary future children. 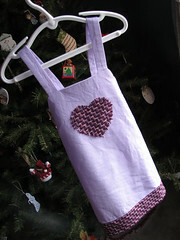 I will most likely make many dresses for the daughters of my friends. They are just so, so sweet, aren’t they? I think I have a problem. Admitting it is the first step, right? Your jumpers are adorable! I find I don’t have time to make baby clothes anymore. I love all the sweet looking little girls clothes that are out there. The designers are actually getting the hang of it!